Brief Synopsis: The focus of this issue is methods of granting powers to heroes and mortals alike. Issue Notes: Booster Gold does not appear in this issue. Supernova Does. POWER UP: "Week 20, Day 1." Supernova stands inside the Batcave beneath Wayne Manor. He appears to have entered without disturbing any of Batman's alarms, perhaps suggesting that Supernova has the power to teleport himself inside the cave. Supernova removes the dustcover protecting the Robin costume worn by Batman's second sidekick, Jason Todd. Todd was killed by the Joker in Batman #488, but through the unique occurrences of the recent Infinite Crisis, has returned to life. Supernova's behavior indicates that he may have at some point lost a sidekick or close friend. 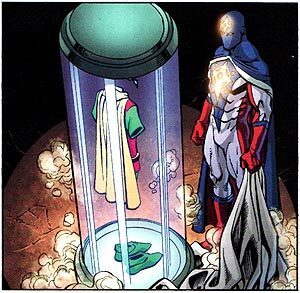 After a brief search through the Batcave trophy cases, Supernova uncovers the Kryptonite-powered gauntlet of Lex Luthor's armored power suit. 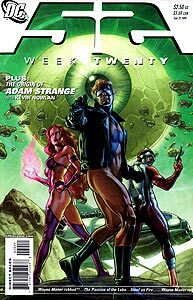 Boosterrific Review: Adam Strange, Animal Man, and Starfire must save an alien civilization from an unknown threat in the primary story of this issue that includes only a brief appearance by Supernova. After recent issues heavy on set-up for future stories, the events of this issue are a refreshing action adventure in the long tradition of DC's space operas.